To unite behind a lie is powerLESS. To vote and truly reflect your principles and morality is powerFUL. Some people have proved that they are without virtue and so morally shallow that they can imagine winning only in the short-term outcome of a single election. Driven by fear, they scream for "unity" over morality and principle; it is a unity that they hope creates a “win.” But WHAT will they WIN? If you violate your principles for victory, what have you won? If your only driver is fear, you are equal to a beast in a cage. No HUMAN has to ever go there; we are smarter than that. Psychological wins at this point in our history are as important as actual physical wins. The only thing that is slowing down draconian measures is the fear the ruling elite have of losing control when masses of people awaken. After all the ruling Elite in America and Europe number less than ten thousand. And they are weak, pampered people whose fear drives them more than any other principle or emotion, they live in luxurious CAGES, surrounded by massive security. Even their security is for HIRE. THEY ARE FRIGHTENED OF US. AT this point in History, The psychological win ON PRINCIPLE, tens of millions refusing to be herded like slaves in the slavers game - is the most powerful weapon we have. 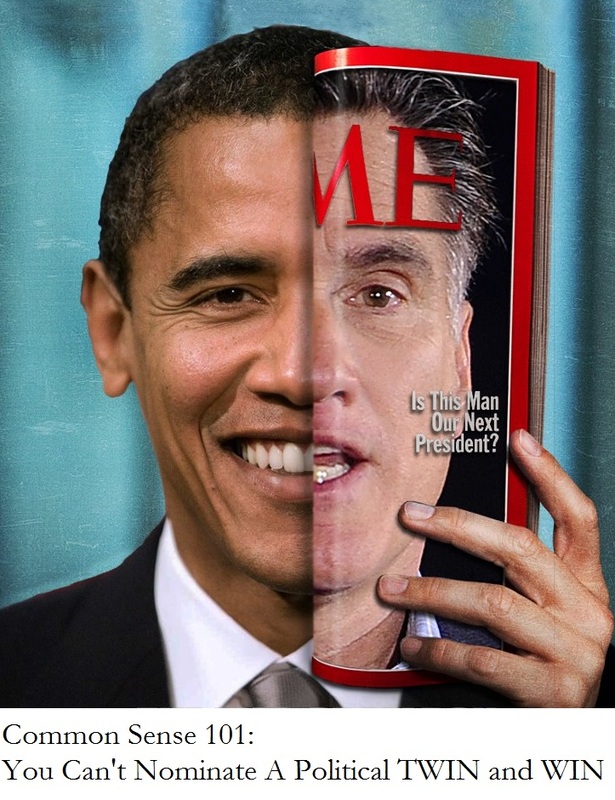 When I say that Obama and Romney are twins - what does that mean? 1. Barack Obama and Mitt Romney both supported TARP. 2. Mitt Romney supported Barack Obama's "economic stimulus" packages. 3. Mitt Romney says that Barack Obama's bailout of the auto industry was actually his idea. 4. Neither candidate supports immediately balancing the federal budget or even balancing it in the next 25 years. 5. They both believe in big government and they both have a track record of being big spenders while in office. 6. Barack Obama and Mitt Romney both fully support the Federal Reserve. 7. Barack Obama and Mitt Romney are both on record as saying that the president should not question the "independence" of the Federal Reserve. 8. Barack Obama and Mitt Romney have both said that Federal Reserve Chairman Ben Bernanke did a good job during the last financial crisis. 9. Barack Obama and Mitt Romney both felt that Federal Reserve Chairman Ben Bernanke deserved to be renominated to a second term. 10. Both candidates oppose a full audit of the Federal Reserve. 11. Both candidates are on record as saying that U.S. Treasury Secretary Timothy Geithner has done a good job. 12. Barack Obama and Mitt Romney have both been big promoters of universal health care. 13. Mitt Romney was the one who developed the plan that Obamacare was later based upon. 14. Wall Street absolutely showers both candidates with campaign contributions. 15. Neither candidate wants to eliminate the income tax or the IRS. 16. Both candidates want to keep personal income tax rates at the exact same levels for the vast majority of Americans. 17. Both candidates are "open" to the idea of imposing a Value Added Tax on the American people. 18. Barack Obama and Mitt Romney both believe that the TSA is doing a great job. 19. Barack Obama and Mitt Romney both supported the NDAA. 20. Barack Obama and Mitt Romney both supported the renewal of the Patriot Act. 21. Barack Obama and Mitt Romney both believe that the federal government should be able to indefinitely detain American citizens that are considered to be terrorists. 22. Both candidates believe that American citizens suspected of being terrorists can be killed by the president without a trial. 23. Barack Obama has not closed Guantanamo Bay like he promised to do, and Mitt Romney actually wants to double the number of prisoners held there. 24. Both candidates support the practice of "extraordinary rendition". 25. They both accuse each other of shipping jobs out of the country and both of them are right. 26. Both candidates are extremely soft on illegal immigration. 27. Neither candidate has any military experience. This is the first time that this has happened in a U.S. election since 1944. 28. They both believe in the theory of man-made global warming. 29. Mitt Romney has said that he will support a "cap and trade" carbon tax scheme (like the one Barack Obama wants) as long as the entire globe goes along with it. 30. Both candidates have a very long record of supporting strict gun control measures. 31. Both candidates supported the TARP bailouts and the auto bailouts. 32. Both candidates have been pro-abortion most of their careers. Mitt Romney's "conversion" to the pro-life cause has been questioned by many. In fact, Mitt Romney has made millions on Bain Capital's investment in a company called "Stericycle" that incinerates aborted babies collected from family planning clinics. 33. Barack Obama and Mitt Romney both believe that the Boy Scout ban on openly gay troop leaders is wrong. 34. Both candidates supported the recent hike of the debt ceiing by $2.4 Trillion. 35. They both believe that a "two state solution" will bring lasting peace between the Palestinians and Israel. 36. Both candidates have a history of nominating extremely liberal judges. 37. Like Barack Obama, Mitt Romney also plans to add "signing statements" to bills when he signs them into law. 38. They both have a horrible record when it comes to job creation. 39. Both candidates believe that the president has the power to take the country to war without getting the approval of the U.S. Congress. 40. Both candidates plan to continue running up more government debt even though the U.S. government is already 16 trillion dollars in debt.